An excellent, low-profile antidote to low-calibre flatscreen TV sound quality. Home cinema leader Onkyo has launched the world's first true one-box, high definition (HD) surround system, designed specifically to add a new dimension to the typically 'so-so' sound quality typical of the latest flatscreen TVs. The innovative HTX-22HD 2.1-channel digital home cinema system is based around a "one-box" A/V amplifier with built-in subwoofer and comes with two front satellite speakers. The system has built-in Dolby TrueHD and DTS-HD Master Audio decoders that allow it reproduce bit-for-bit high definition surround sound, making the HTX-22HD a superb partner for the latest generation Blu-ray and DVD players, gaming consoles and digital television receivers. Onkyo is also proud to announce that the HTX-22HD is also the world's first system to incorporate DTS Surround Sensation. Unveiled at CES 2008 this long-awaited new software algorithm delivers a virtual 5.1 surround sound experience from just two speakers. For dedicated home cinema fans, purchasing an optional, add-on package of centre-speaker and two rear surround speakers can transform the HTX-22HD into a fully-fledged 5.1 system - all the necessary speaker terminals are already located at the rear of the main unit. 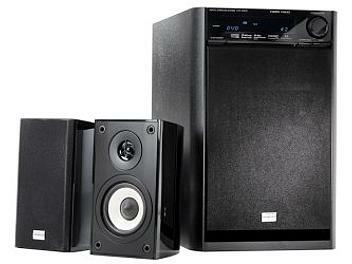 Excellent sound quality and ease of ease were the top priorities for Onkyo during the development of the HTX-22HD. For that reason, the system includes Audyssey 2EQ room calibration to precisely match surround sound to your home. It also includes the new Audyssey Dynamic EQ loudness correction technology - found in Onkyo's new generation standalone AV receivers - for dynamic, detailed surround sound even at low volumes. Thanks to the inclusion of RIHD (Remote Interactive via HDMI) the user can also integrate and seamlessly operate the system with selected HDMI-equipped playback sources and TVs from other manufacturers.